Lacy squares worked in a rich shade of teal merino create a stylish accessory, quickly assembled in the join-as-you-go method. Yarn: Moda Dea Washable Wool [100% merino wool superwash, 166 yds/100 g ball] or yarn of choice that works to gauge. Scarf is made of 38 squares arranged two squares across by nineteen squares long. After first square is complete, subsequent squares are created and attached by join-as-you go method. Make Square 2, joining to side of Square 1 with single-sided join. Make Square 3, joining to top of Square 1 with single-sided join. Make Square 4, joining to side of Square 3 and top of Square 2 with double-sided join. Additional rows are added with pairs of squares. First square of row is attached with single-sided join, second square of row is added with double-sided join. See diagram at end of pattern. Round 3 Sl st into first ch-5 lp, ch 1, *in ch-5 lp work (sc, hdc, dc, ch 2, dc, hdc, sc) (corner completed), ch 2,* rep from * to * around, join with sl st. Round 4 Ch 1, sc in ch-2 sp to right of join, ch 5, *in corner work (sc, ch 3, sc), ch 5, sc in next ch-2 sp, ch 3, sc in same sp, ch 5,* rep from * to * around, ending with sc in ch-2 sp, ch 3, join with sl st. Fasten off. Rounds 1-3 Repeat rounds 1-3 of Square 1. Round 4 (Single-sided joining rnd): Ch 1, sc in ch-2 sp to right of join, ch 5, sc in corner, ch 3, sc in same corner; ch 5, sc in next ch-2 sp, ch 3, sc in same sp; ch 5, sc in next corner, ch 1; holding squares with wrong sides tog, sl st in corner on previous square, ch 1, sc in same corner on current square; ch 2, sl st in next ch-5 lp on previous square, ch 2, sc in next ch-2 sp on current square; ch 1, sl st in next ch-3 lp on previous square, ch 1, sc in same sp on current square; ch 2, sl st in next ch-5 lp on previous square, ch 2, sc in next corner on current square, ch 1, sl st in corner of previous square, ch 1, sc in same corner on current square. Finish current square as follows: ch 5, sc in next ch-2 sp, ch 3, sc in same sp, ch 5, sc in next corner, ch 3, sc in same corner, ch 5, sc in last ch-2 sp, ch 3, sl st in beg sc. Fasten off. Rounds 1-4 Rep Square 2, joining to top of row 1 (see assembly diagram). Rounds 1-3 Rep Rounds 1-3 of Square 2. Round 4 (Double-sided joining rnd) Ch 1, sc in ch-2 sp to right of join, ch 5, sc in corner, ch 3, sc in same corner; ch 5, sc in next ch-2 sp, ch 3, sc in same sp; ch 5, sc in next corner, ch 1; holding squares with wrong sides tog, sl st in corner of previous square, ch 1, sc in same corner on current square; *ch 2, sl st in next ch-5 lp on previous square, ch 2, sc in next ch-2 sp of current square; ch 1, sl st in next ch-3 lp on previous square, ch 1, sc in same sp on current square; ch 2, sl st in next ch-5 lp on previous square, ch 2, sc in next corner on current square, ch 1, sl st in corner of previous square*, sl st in corner of next previous square, ch 1, sc in same corner on current square; rep from * to * once. Finish current square as follows: ch 1, sc in same corner, ch 5, sc in last ch-2 sp, ch 3, sl st in beg sc. Fasten off. Repeat instructions for second row until scarf is 19 squares long, joining first square of each pair with single-sided join (as in Square 2) and second square of each pair with double-sided join (as in Square 4). Weave in ends. 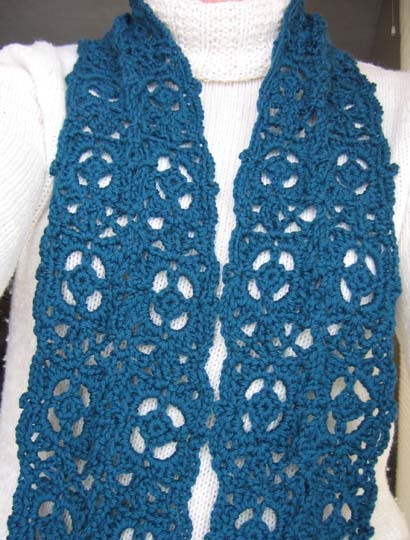 Block scarf by dampening and laying it out on thick towels, spreading out lace pattern. Cover with another towel and leave to dry.